Red deer are our largest deer species and wild land mammal. Research has shown they have had a continuous localised presence in Ireland since Neolithic times over the past 5,000 years. As a result of deforestation, over hunting and the Great Famine (1845 – 1847) many localised populations around Ireland became locally extinct. 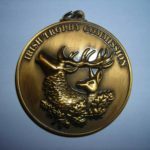 By the middle of the 19th century the last home of the Red deer was in the woodlands and mountains around Killarney, where their preservation was due to the strict protection of the two large estates of Herberts of Muckross and the Brownes, Earl of Kenmare. The current population in Kerry, is the only red deer population in Ireland that can claim the long ancestry – direct descendants of a 5,000 year old introduction of native Scottish red deer from Britain. All other populations were introduced to Ireland during the 19th century onwards. It is known that at the turn of the century there were in excess of 1500 Red deer in Killarney. This declined between 1900 and 1960 to as few as 60. As a result of rigorous protection, they are believed to number 700 in 2017 mainly within the National Park. In the 1980’s a number of Red deer were transported by helicopter to a private Island, Inishvickillane off the Kerry coast to protect their future conservation status in the event of hybridisation with Sika deer, who are also present in Killarney National Park since their introduction to Killarney in 1865. The herd flourished but are smaller in size due to limited feeding and the harsh Atlantic Island environment. Deer were also transported to Connemara in Galway but the herd did not survive due to poor feeding and interbreeding with local non-native Red deer transported from Windsor Park (mixed with Eastern European red deer genetics) in the UK. The Red deer has a rich red coloured coat, darkening down to a greyish brown in winter. 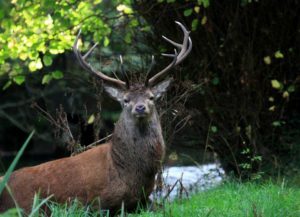 A mature stag carries a large rack of antlers, which are at peak condition in the early autumn for the rut, when they are used for bouts of sparring between rivals. A dominant animal may have 18-20 points (tines) on the antlers, although 14-16 is more common. A stag with more than 12 tines is known as a ‘Royal’. A fully-grown Red stag can stand 120cm (48”) high at the shoulder and can weigh anything up to 190kg (420Ibs). A female (hind) is smaller with shoulder height up to 110cm (44”) and a weight of up to 110kg (240Ibs). Red deer have very short tails which are the same colour as its coat, surrounded by a creamy coloured rump. While some claims have been made, the number of wild Red Deer and their hybrids in Ireland are unknown as no national deer census have been carried out. Two large scale genetic studies have been completed which detected large numbers of hybrid deer in Co. Wicklow, along with pure sika deer. However, no pure red deer were found in Co. Wicklow. A small group of hybrids were identified along the Cork-Kerry border, but these have since been eliminated and there is ongoing monitoring. Hybrid deer (between sika and red deer) can take on appearances that look similar to their parents, but there is always a mix of external characteristics, so the resulting offspring just doesn’t quite look like a pure red deer or sika. The main red deer range can be found on Torc, Cores and Mangerton Mountains with other herds in the lowland areas of the National Park in Killarney, Co Kerry. These are the only native wild Red deer that exist in Ireland today. Sika deer are potentially a threat to the genetic integrity of the Red deer herd, as they are known to be capable of interbreeding. So far, no cases of crossbreeding between Red and Sika have been recorded in Killarney (as has happened in Wicklow), but the situation is being carefully monitored, and a high priority is attached to maintaining the genetic purity of the native herd. Other herds of red deer can be found in Glenveagh, Co. Donegal, Connemara, Co Galway and areas of Co Mayo. These are not native herds but were introduced from Scotland and Windsor Park in the 19th Century. Red deer stags are easiest to see in late September and early October during the rut. In recent times, Red deer have also been seen in Limerick, Wexford, Louth and Meath. The latter most likely as a result of Ward Union Stag Hunt in Meath, where stags were specially bred for the hunt and released into the Countryside. The genetic heritage of these are unknown but there is ongoing genetic analyses being conducted. Red deer are a herd deer but group size is influenced by habitat, they form larger herds when living in open country with smaller groups in woodland areas. Hinds (females) and stags (males) will only come together during the rut, for the rest of the year they are sexually segregated.Red deer are primarily grazers and will graze all year round, however they will eat heather shoots, mosses, lichens and even unpalatable mat-grass to see them through winter to the following spring. They will also feed on agriculture crops and trample/flattened cereal stands which they use to lie-up in cover. Stags grow antlers in late Spring and have a soft skin covering called velvet. Antlers will grow until late summer; the velvet dies and is – scraped off. Neck muscles will swell, thick manes grow on the throats and aggression increases. The antlers are fully grown by late summer and will remain until they are shed in early spring. Antler size to some extent depends on age but more importantly on the deer’s health, nutrition and genetics. In the wild the best heads are found on 6-9 year old animals. Hinds may breed at a year and a half, but it is more common at two and half years of age, if pregnancy does not occur, ovulation (heat) will occur again in 21 days later and repeatedly until pregnancy occurs. Pregnancy in a Doe lasts 33 weeks and calves are born in June. It is important to note that calves do not follow their mother for two weeks. While the mother is off grazing the fawns are left lying in cover. Such calves are not abandoned and should not be touched or removed. calves may continue to suckle until the next sibling is born. Hinds and calves will socialise and be introduced to the larger family group during late July and August. It is not surprising to observe a older matriarch hind with her current year’s calf, along with her previous year’s offspring and their respective calves in a group. Upon reaching a year old, the young male yearlings will separate from their mother to seek out and join bachelor male groups. Hinds may breed at a year and a half, but commonly it is at two and half years of age when at least 90% of their body growth (skeletal growth and muscle mass) has occurred, with calves born in June. The placenta (afterbirth) is eaten by the female, to hide any sent or evidence of the birth. The calf is hidden while the hind feeds alone during the first few weeks of its life. Red deer are a protected game species and may only be hunted with a licence from the National Parks and Wild Life Service. 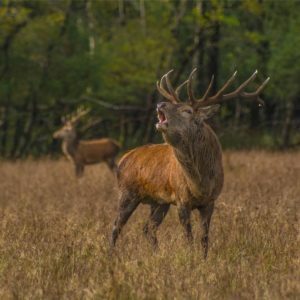 Red stags may be hunted from the 1st of September until the 31st of December (no season in Kerry for stags) and Hinds may be hunted from the 1st of November to the 28th of February 28th, between the hours of, 1 hour before official sunrise and 1 hour after sunset. It is illegal to hunt deer at night or with the use of dogs. 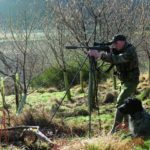 Hunting of Red deer (stags and hinds) is strictly prohibited in Co Kerry. 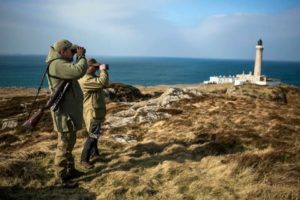 Irish Deer Commission campaign on the importance of conserving our native deer species as part of Ireland’s rich natural heritage and biodiversity. Extensive genetic analyses have shown that there is very low genetic diversity within the Kerry red deer herd, which may prove to be highly disadvantageous if a major event were to occur, for example the outbreak of disease or wild fire which may kill the deer. Low genetic diversity will impede population recovery and may in fact, be detrimental. 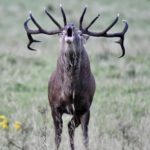 With particular importance on the unique DNA blood-lines of the wild Irish Red deer in Co Kerry and the island of Inishvickillane, off the coast of Co. Kerry. The sustainable conservation of the Kerry red deer is of utmost concern to the Irish Deer Commission. Ongoing genetic monitoring is vital to safe guard the genetic integrity of the pure native Kerry red deer population. Carden RF, McDevitt AD, Zachos FE, Woodman PC, O’Toole P, Rose H, Monaghan NT, Campana MG, Bradley DG, Edwards CJ (2012). Phylogeographic, ancient DNA, fossil and morphometric analyses reveal ancient and modern introductions of a large mammal: the complex case of red deer (Cervus elaphus) in Ireland. Quaternary Science Reviews 42: 74-84. McDevitt AD, O’Toole P, Edwards CJ, Carden RF (2012) Landscape genetics of red deer (Cervus elaphus Linnaeus, 1758) in Killarney National Park, Co. Kerry. In: Butler F, Kelleher C (eds) All-Ireland Mammal Symposium 2009, pp. 23-30. Irish Naturalists’ Journal, Belfast, Northern Ireland.